How to design a Restaurant/Commercial Kitchen? Commercial Kitchen design is completely different from the residential Kitchen design. The design considerations in terms of functionality and circulation of space play a great role. The design of services such as water supply, drainage, fire fighting, Heating and Ventilation systems, Exhausts etc play a major role in the successful working of a Kitchen. In this article, we will discuss various design considerations for Restaurant/Hotel(Commercial) Kitchen design. Before, we get onto designing, it is very important that we discuss the menu of the Restaurant. The type of food menu will decide the design parameters to be considered. The space has to be designed in a harmonic flow so as to serve to the increasing public without any hassle. 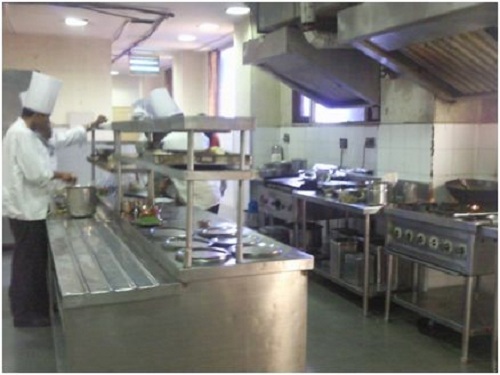 The study of different departments in a Commercial kitchen is to be carried out. After the analysis of your survey, you can figure out the list of various departments that you incorporate into your Kitchen design. Ofcourse, it also depends on the wish of the client as to what all departments he would prefer in his Restaurant/Hotel. Departmentalization is very important in a hotel since it involves lot of work and is meant to serve a large number of people. That is why studying the pattern of functioning in a Kitchen is very important. It helps us design the spaces according to the various activities that are to be carried out. Smooth and coordinated traffic flow in a Kitchen is very important to maintain the efficiency of the work and activities that are carried out in the Kitchen. To ensure smooth traffic flow in a Kitchen, the spaces are to be designed keeping in mind all the major and minor activities that will be taking place. Good Hygienic conditions are to be maintained. The location of toilets and bathrooms has to be carefully designed. This will help in ensuring hygienic conditions in the Kitchen. Proper selection of flooring tiles is important. The texture of the flooring tiles should be such that it should not cause slippery surfaces which could cause incovenience to the workers in the Kitchen. Proper DPC (Damp Proof Course) is important to take care of the leakage problems in the Kitchen floor. Tiles are preferable for walls to avoid stains. Good breakdown of what needs to go into a commercial kitchen.